We have the masters’ words, we can read them and often they are clear enough that we can physically re-create them. We can re-create them in the sense that every word written affects our position, every cut mentioned is executed and each defense is purposefully made. Still, we are often left wondering and questioning ourselves: are we really doing it right? Sometimes there is a bit of key information missing. Things like “left or right” in a situation where both can be made to work. There are processes we can use to find out, or calculate probabilities. We can look for similar techniques within the same source, or other sources from the same time and place (or otherwise connected), we can test the technique in gradually faster and demanding drills, we can consider it in terms of practicality, distance traveled, in relation to the beginning and end positions and so on. But unless stated by the master we can rarely be absolutely certain. Yet it is not uncommon for the researcher or instructor of historical fencing to state things as truths even though they are not. This is a necessary “evil” that saves from all instruction and discussion from being utterly tedious with endless phrases highlighting the uncertain and hypothetical nature of our art. Honesty, when called for, is still important though. There is no question that, until we can download skills directly into our brains like in The Matrix, hands-on instruction and physical demonstration are the best ways to learn a martial art. In this kind of learning environment, the uncertainties don’t cut it. There is success and the occasional failure, and the ifs and maybes are quickly answered in real-time. The interpretation and choosing what is certain has happened earlier. From the perspective of a scholar this leads to an interesting situation. I can seek the instruction of people like Achille Marozzo alone, reading their books and treatises and only using my personal experience to best interpret them, or I can seek for instruction from contemporary martial artists. The latter not only to augment my interpretation, but to actually learn from these people, which is a totally different thing. Having spent years and years studying the Bolognese Spada sola from the works of Marozzo, Antonio Manciolino, Giovanni dall’Agocchie and the Anonymous Bolognese, I have eventually managed to come up with a working system that (to my mind, and to many of my peers as well) is both true to the original sources and efficient regardless of the context. But the work has been rather enormous, and it is nowhere near done yet. I have a feeling that my lifetime might not be enough to go through a similar process with all the Bolognese weapon combinations and types. So, I have sought instruction. 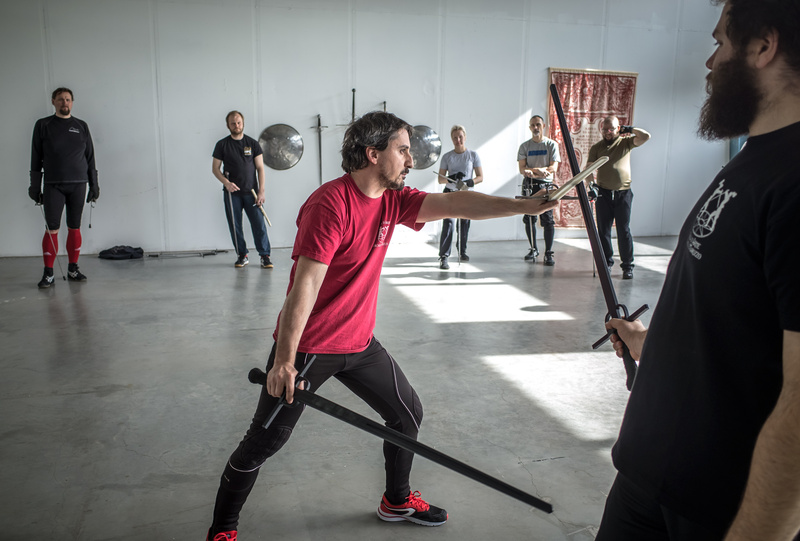 For example, we had Luca Dazi from the Sala d’Armi Achille Marozzo visit us last weekend, teaching a two-day workshop on the sword and dagger fighting styles of Manciolino, di Grassi and Marozzo. Beautiful material and these guys are clearly ahead of us in this area of study. Learning from them was truly a boost. But it has interesting effects. I had read Marozzo’s and Manciolino’s sword and dagger material before. But I had only seen it in my mind’s eye, which — at this stage of my study — often produces rather cloudy visions when guided by the masters’ words. Now I saw it come to life thanks to the work others have focused on for many years. And now my mind is enlightened by multiple sources of information. This change is so remarkable that I can feel it in every cell of my body. It leaves me with options however. Will I elevate what I have seen to the highest standard, will it be what I aim for, the internal model of the perfect execution of these techniques? Or will it only serve as a tool for me the next time I discourse with the masters of old? Given my history it is likely to be a bit of both. I have no problem having people I consider my instructors and authorities in a something, but I am also keen on research. The process takes time, but for me it is the most rewarding one. When teaching a martial arts we deliver the best results when we can teach from our own experience material that we know thoroughly and are comfortable with. Sometimes we just don’t have this, and are forced to teach someone else’s material, in the way an assistant instructor often does. Instead of teaching his own take on a subject he or she teaches what he or she expects the instructor would. If our source and instructor is one of the original masters, are we then their assistant instructors? Do we teach what we expect they would want us, or do we teach the little we think we own of the art? In either case, this understanding is often a bit cloudy, and characterized by the many ifs and maybes that we carry with it. Even when we hide it from our students, we are aware and often burdened by it. I have felt this many times. It is easier for me now, if teaching sword and dagger, to refer to Luca’s interpretation. I can take comfort in knowing that I can always ask him and find a solution for any problem (not in real-time but after the class). If I was working directly from the source, there would be the cycle of searching, reading, interpreting, considering and testing with each question that arose. It is easier this way, and more efficient. I only need to trust that the work Luca has done is of standards that I approve of — and in his case it is. This way I can borrow his knowledge easily and take a short-cut in learning a new aspect of this art. This is the community working together at its best. But this process also happens with your personal study of the sources. Learning from a master who has been gone for almost 500 years is a little slow, but it can be done. I have seen this happen with the assalti, the forms described my both Marozzo and Manciolino. The more I read about them and practice them, the more certain I become. Not only about the interpretations, but in the execution. I can even isolate the questions of “right or left” and if necessary create optional ways of executing the sequences and reasons why to do one or the other. It simply becomes a branch in the exercise and not a point of confusion. Once my certainty is on a certain level, I can begin to teach the form to someone who has not studied the original text. I can’t do that until the process has been taken far enough, but from there the student will learn the form a great deal quicker than I did, because he learns it in a hand-on way instead of reading from a book. As we learn a martial art in a systematical way, we assign techniques and concepts into a framework of connections, or we are more medieval, we place things in the rooms of a memory castle. It is useful to analyze your process of doing this, and to weigh your priorities. How well do you wish to know the original sources? What do you wish to let influence your knowledge? Whose examples to follow? How will you build the models that you try to follow when physically executing the actions? And how able are you to change them if better instruction or new information becomes available? And eventually, how certain do you need to be?